Since 1945 America has voluntarily accepted leadership of the democratic West and therefore, ultimately, the responsibility for preserving peace in the world. Since the end of WWII there has been no major war, no open conflict between great powers. This is the longest such period of peace, nearly 65 years, in the recorded history of the world, which is objective testimony to the quality and success of American leadership. The questions we now face as Barack Obama is subjected to his first practical tests as world security leader are: Can the U.S. continue in this role? Has it the power, the self-confidence and the will to do so? And if America declines to continue as world sheriff, will anyone else take on the duty? The last question is the most easily answered: No. The UN, whether in the form of its Security Council or General Assembly, has consistently failed to prevent even minor conflicts, except under pressure from strong American leadership. It is just as likely to exacerbate tensions or aggravate violence as it is to end it. NATO, without the U.S., is nothing, as it has repeatedly shown in the Balkans and most recently Afghanistan. The EUwithin its own continent, let alone outside itshows no capacity for leadership in keeping the peace, much less the willingness to supply the physical force needed to give such leadership real meaning. Britain is the only European state that can be relied upon to fight aggression, and then only in conjunction with American leadership. In the 1980s one of Britain's territories, the Falkland Islands, was occupied by a second-class power, Argentina. Britain fought a solitary campaign successfully to expel the aggressor. But that effort was notable for three things: an exceptionally resolute leader at the helm, cast in the Churchill mold, Margaret Thatcher; the willingness of President Ronald Reagan to give Britain's forces a significant measure of covert logistical support; and the characteristic unwillingness of the Continental Europeans to give Britain any help. If Europe is useless in keeping the peace, what about the rest of the world? Of the three largest powers, Russia has consistently refused to take any measures other than in direct support of its own security. This is true whether the threat comes from international terrorism or from rogue would-be nuclear powers such as North Korea and Iran. Indeed, Russia is more likely to give moral and even physical support to a lawless aggressor state than to join in a collective effort of restraint. In this respect it is still primarily motivated by the ideological and emotional impulses of the Cold War. China is an unknown quantity as a potential peacekeeperand is most unlikely to prove an altruistic one. So far the auguries are not encouraging. The instinct of China's leadership is to oppose any strong moves by the U.S., even when the risk to peace is real. In a world left defenseless by the retreat of American leadership, it is hard to see China acting, except in strict defense of its own national interests. It is not even prepared to restrain North Korea's nuclear ambitions, even though the North, if successful, could ultimately become a threat to China. Beijing has never been willing to do anything practical to prevent nuclear proliferation. India, being a democracy under the rule of law, is a different case. It's possible to foresee a day when Indian leadership will provide real help in keeping the world at peace. But that time is in the future. India has neither the physical power nor the geopolitical instinct to operate outside its sphere of direct influence. But the potential exists, and the U.S. should make every effort to include India's participation, moral and material, in any peacekeeping effort. For want of any alternative, it looks as if America will be obliged to continue in its role as the ultimate guardian of the peace. Has it the physical power? Certainly. Though hit hard by the world recession, the U.S. still has the means to keep its armed forces strong and active all over the world. There's no evidence that sustaining its global military effort has weakened its economyquite the contrary. It's worth remembering that it was only the onset of WWII in September 1939 that really ended the Great Depression in the U.S. and allowed Wall Street to regain its pre-October 1929 levels. As for whether the U.S. is willing to carry on with the task of keeping peace in the world, it really has no alternative. The option of retiring within its own sphere of interest or even behind the defense of a highly efficient and comprehensive antimissile screen is not a real one. It would be against its long-term interests, as well as the American people's moral nature. It is right for Mr. Obama to look at the world afresh, to propose initiatives and seek new solutions to old problems. But he will find, as have other Presidents before him, that the range of options is limited. He, like they, will discover through bitter experience that he has to be the lawman, that he must keep the world-town safe. And, as those other Presidents also became aware, only Britain can be trusted to stand by him as deputy sheriff. 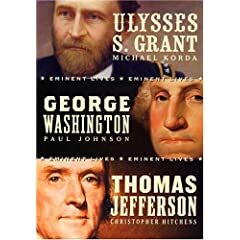 Eminent British historian and author Paul Johnson's latest book is "American Presidents Eminent Lives Boxed Set: George Washington, Thomas Jefferson, Ulysses S. Grant". Comment by clicking here. 03/24/09: Short works of genius that cheer up the writing profession 02/11/09: What would Darwin do? 11/07/07: Are famous writers accident-prone? 09/20/07: Who Will Say I Promise to Lay Off? 08/03/06: Why is there no workable philosophy of music? 04/25/06: Was Washington right about political parties? 04/12/06: Let's Have More Babies!